In case you haven’t heard, Google has launched the Chromecast, a $35 device the size of a large thumbdrive that plugs into your TV’s HDMI input to provide video content wirelessly from your existing smartphone, tablet or PC. It will stream from Google Play, YouTube, Netflix and mirror whatever you have in your Chrome browser to your TV with just the press of a button. I’m not writing an article telling you about its features, I’m here to tell you to buy one. Why? Because the features it currently possesses are not the only features it will have. 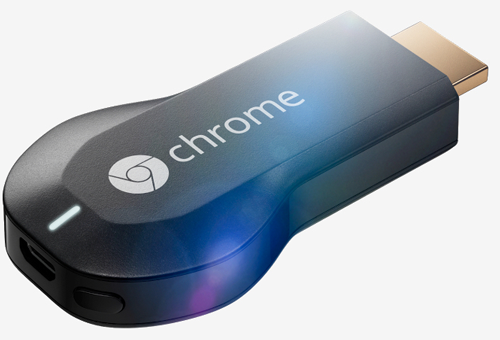 Google is providing a developer kit to allow anyone the ability to add Chromecast content. The possibilities are limitless. Only minor modifications will need to be added to existing mobile apps to make them Chromecast compatible. And not just for Android users, but even for iOS devices. For $35, you must buy one of these dongles. With enough adopters this new price point will blow the standard $99 price point from the likes of Apple TV and Roku out of the proverbial water and force prices down across the board. Plus the inter-operability between operating systems means the closed model Apple deploys will become archaic. Imagine a media-streaming device, plus game console, for less than the cost of one month’s HBO subscription. It even makes the new Xbox One and PS4 consoles seem medieval by comparison. But wait! There’s more! Netflix is providing three months free subscription, even to existing subscribers, so this $35 will only cost something like $11 to Netflix subscribers. The Netflix deal has been rescinded. Crap! I was looking around earlier on the Chromecast webpage trying to find the Netflix deal details.